There is no such thing as a perfect cocktail. This comes from the man who many would argue makes exactly that. 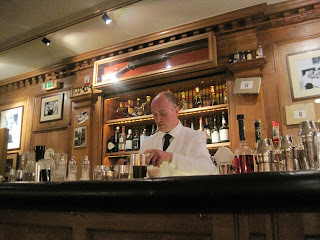 But Colin Field, Head Bartender at the Bar Hemingway for the past 16 years, believes that to be great, a cocktail must be viewed within an entire context of who’s drinking it, why and where. In the past, I’ve intentionally avoided Papa Hemingway’s old haunt for Wednesday Cocktail Adventures. Having been there before, I didn’t doubt that the cocktails would be perfectly executed. But, for me, the 30 Euros price tag is near impossible to justify – even given the coddling and historical elegance of the Ritz. Our group of 12 sat in the bar while Colin shared his cocktail philosophy, stories and samples. This is a man who has a lot of thoughts and theories on drinking. This is also a man who invites overused adjectives: stylish, impeccable, personable, professional. You simply have to respect anyone that elevates their chosen profession to such a level. The hour and a half course stretched closer to two hours as we broke into groups for an exercise – which included sampling the finished product. Initially, I wasn’t certain that I could learn much in such a short period of time. I can now confidently say that anyone with a serious interest in cocktails will appreciate an afternoon spent in the company this exceedingly charming bartender. By 16h00 I was revamping some of my own thoughts on cocktails and revising my budget to include more drinks at the Ritz. If you’re hoping to learn how to make a mojiti or toss shakers, this is not for you. 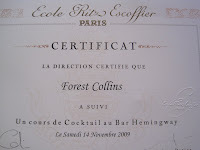 But, if you want to better understand what makes cocktails interesting, personal and palatable, don’t hesitate to sign up. 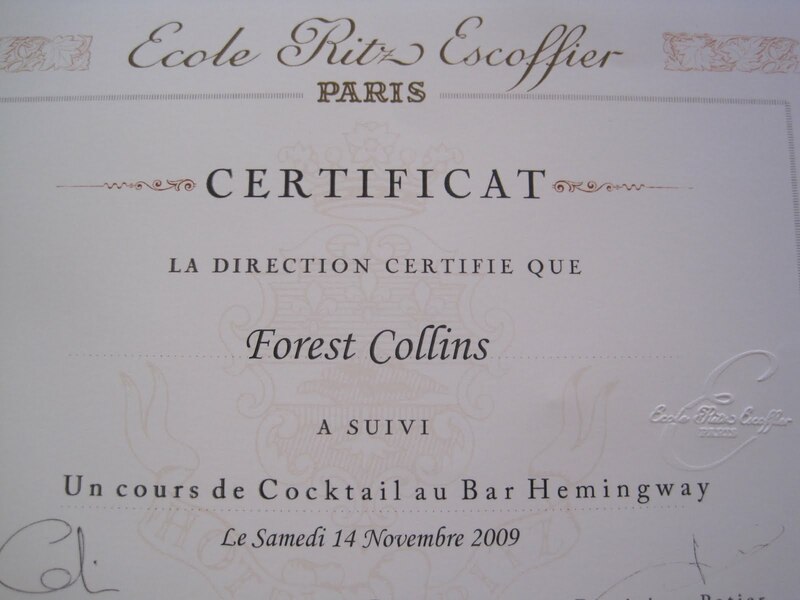 By the time I left – Ritz martini glass and certificate in hand – I was thinking: there may not be a perfect cocktail, but there just might be a perfect bartender. You know I admire your blog but, seriously, enough with adding to my already endless list of things to do the next time I'm in Paris. This sounds wonderful and is up at the top of the list. Good evening, I'm a journalist and I'm typing to you for asking if I can use the sources that you published here. It's for an article I'm going to write on my web site. Please let me do the article exactly like this one. I'm not sure what you're requesting but do not use my content elsewhere without my express permission. I love to do cocktails, I always try to impress my girlfriend wit a new flavor od mixture for a cocktail.